CAPTION: Teacher of the Year winner and nominees were recognized at the Chillicothe Education Foundation annual reception Wednesday evening. From left: Ed Douglas, CEF President; Sophie Chamber, Teacher of Year; Brandon Dennis, GRTS nominee; Doug French, CMS nominee; Dianna Haynes, Field nominee; Tim Cunningham, CHS and CACE nominee; and Superintendent Dr. Roger Barnes. The Chillicothe Education Foundation held its annual benefit reception Wednesday evening at the home of Ed Milbank, CEF board director. The foundation raised more than $24,000 at the benefit, which according to CEF President Ed Douglas was another record-breaking event. Last year was a record breaking year for the reception as well, topping $22,000. At the reception, Douglas thanked all who attended and gave a special thanks to Milbank for hosting the reception for almost 20 years and providing the food and beverages. "It's a great event; and I know everyone really has a lot of fun and it, of course, raises all our funds... it provides funds for all of our major annual programs," Douglas said of the reception. According to Douglas, annually, the CEF spends approximately $12,000 on the Teacher of the Year and Beacon of the Year awards, roughly $4,000 on teacher mini-grants, and there is also money spent on teacher recruitment and retention every year, which varies. In addition to the Teacher of the Year awards, Beacon awards, mini-grants for classrooms, teacher recruitment and retention and student scholarships, the CEF has also taken on various special projects to benefit the district. "Our purpose is to do things that the school can't do itself," Douglas said. The CEF tries to assist the school district in many ways. For example, fundraising for the construction of the new Jerry Litton Memorial Stadium was headed by the CEF, and the land the stadium sits on was also partly purchased by the CEF in 2003. The CEF bought 45.6 acres, and the late Mr. and Mrs. CP Hutchinson donated 15.6 acres of that land. According to Douglas, the land was purchased with intentions of expansion, which will be possible if the school ballot issue passes in April. The school board has been working on a new, district construction plan for about a year. It was decided to build a one-campus district on the CEF land by the existing high school and stadium. "Most recently, when we learned the school wanted to go north where our land is, for the new bond issue for the new school, they didn't feel they could do it because of the cost of a road... that it would put it over the bonding limit... we took the lead in making sure that wasn't an issue for them," Douglas said. Attendees of Wednesday's benefit gathered prior to the evening meal to recognize this year's Chillicothe R-2 Teacher of the Year and Beacon Award (support staff) nominees and winners. Earlier this year, each school nominated one staff member for the Beacon Award. Those nominees were: Rick McCully (Dewey), Lesa Lee (Field), Polly Musselman (Central), Janet Abby (CMS), Ruth Summer (GRTS), and Officer Mike Lewis (CHS). This year's award winner was Mike Lewis. Lewis has worked for the R-2 school system for 15 years as the school's resource officer. Sophie Chambers, fourth grade teacher at Central Elementary School, was named this year's Chillicothe R-2 Teacher of the Year. Chambers has been teaching for six years, all with the Chillicothe R-2 district. Other Teacher of the Year nominees recognized at the reception were: Patty Adkison (Dewey), Dianna Haynes (Field), Doug French (CMS), Tim Cunningham (CHS), and Brandon Dennis (GRTS). The Chillicothe Education Foundation Board consists of: Ed Douglas, president; Mike Turner, treasurer; Robin Westphal, ad hoc school board member; Dr. Roger Barnes, superintendent; Edward P. Milbank, director; Mary Staton, director; Julie McCoy, director; Lindy Chapman, director; Inger Young, director; Dr. Bruce Brodmerkle, director; and Trent Miller, director. CAPTION: The 2015 Teacher of the Year and Beacon Award recipients were announced on Friday in the Performing Arts Center of Chillicothe High School. These awards are funded by the Chillicothe Education Foundation. The Beacon Award recipient was school resource officer Mike Lewis and Teacher of the Year honors went to fourth grade Central School teacher Sophie Chambers. Pictured, from left: Ed Douglas, Chillicothe Education Foundation President; Officer Lewis; Chambers; Superintendent Dr. Barnes. The 2015 Teacher of the Year and Beacon Award recipient were announced Friday afternoon at the Performing Arts Center. Central School fourth grade teacher, Sophie Chambers, was announced as Teacher of the Year, and the district's resource officer, Mike Lewis, was announced as the Beacon Award recipient. Superintendent Dr. Roger Barnes welcomed everyone to the event. "On behalf of the Board of Education, I want to thank the Chillicothe Education Foundation for sponsoring this recognition opportunity. We are truly grateful for the support of our staff and the funded opportunities provided to our students through the annual Mini-Grants, capital projects and the Teacher of the Year and Beacon Award," Dr. Barnes said. President of the Chillicothe Education Foundation, Ed Douglas, also welcomed the crowd, gave background on the Chillicothe Education Foundation and talked about the importance of the Teacher of the Year Award and Beacon Award. "To give you a little background, the Chillicothe Education Foundation was formed in 1992 to encourage the highest educational standards in the Chillicothe public schools and to increase community pride in those schools. Established to provide financial support for enrichment programs and activities where needs are determined, the Foundation receives and administers gifts and bequests which shall benefit education in the Chillicothe R-II Schools," Douglas said. "Some of our projects include the Teacher of the Year Awards, Beacon Awards, Mini-Grants for classrooms, help with teacher recruitment and retention, student scholarships, and our most recent large project, coordinating fundraising for the construction of the new Jerry Litton Memorial stadium built on property the Education Foundation purchased for school expansion back in 2003." Douglas mentioned that the Teacher of the Year award and the Beacon Award are important because it's vital to recognize those who not only do their job well, but go above and beyond the call of duty. The Teacher of the Year program began 23 years ago to honor those educators who go above and beyond to promote educational excellence in the R-2 District. Also at the event Friday, staff members were also recognized at the event for their years of service to the Chillicothe R-II School District. Five years, 10 years, 15 years, 20 years, and 25 years service pins were handed out by the Chillicothe R-II Board of Education Vice President Brent Turner. 5-year service pins were awarded to: Cindy Collins, Angela Cook, Tim Cool, Will Ford, Ellen Hansen, Anthony Hinnen, Kaycee Kaufman, Lance Martin, Dan Nagel, Brian Sherrow, Ray Summers, Darrell Barlow (bus driver), Denise Loyd, Jim Luzader, Joe Rinehart, Alan Samm (bus driver). 10-year service pins were awarded to: Jill Allen, Hillary Beemer, Diana Holcer, Kari Keller, Penny Kennebeck, Keri Rodenberg, Billy Smith, Sondra Sturgess, Anita Tatum, Natalie Leamer, Kathy Midgyett, David Sheler and Bev Meyer. 15-year service awards were awarded to: Lee Caughron, Katherine Gibson, Karen Jackson, Mike Jones, Becky Lewis, Tara O'Dell and Mike Lewis. 20-year service pins were awarded to: Kristy Clampitt, Don Dennis, Melissa Englert, Shelly Hayen, Tammy Price, Bill Shaffer, Shanda Wagers, Richard Gibson, Marcella Murray and Kristi Newlin. 25-year service pins were awarded to: Debra Brick, Beth Milanovich, Lynn Allnut and Mary Ann Scott. 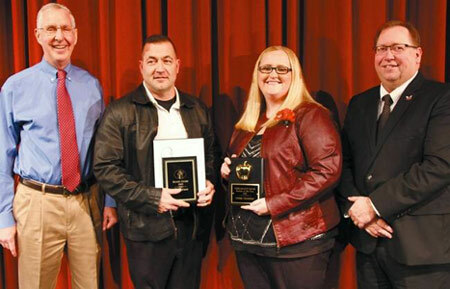 The 2015 Teacher of the Year candidates recognized on Friday were: Patricia Adkison from Dewey / Garrison; Dianna Haynes from Field; Sophie Chambers from Central; Doug French from Chillicothe Middle School; Tim Cunningham from Chillicothe High School / Chillicothe Alternative Center for Education; and Brandon Dennis from Grand River Technical School. 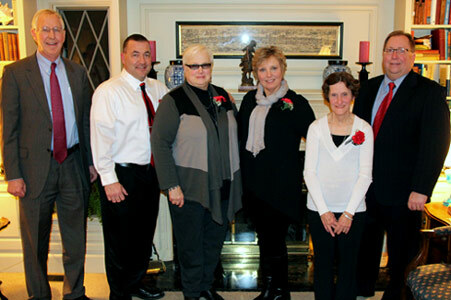 The 2015 Beacon Award candidates recognized were: Rick McCully from Dewey / Garrison; Lesa Lee from Field; Polly Musselman from Central; Janet Abbey from Chillicothe Middle School; Mike Lewis from Chillicothe High School and Chillicothe Alternative Center for Education; and Ruth Summers from Grand River Technical School. Teacher of the Year candidates and Beacon Award candidates were nominated by fellow staff members. When a staff member nominates another staff member, he or she must write why their nominated worker should be chosen. A couple of those support letters are sent to area superintendents who will review them and decide a winner. In addition to being nominated, Teacher of the Year candidates are asked to submit an application, letters of reference, and they also go through an interview process with area superintendents. Sophie Chambers was announced the winner (Sophie Chambers teaches 4th grade and has taught for 6 years, all with the Chillicothe R-II School District). Mrs. Chambers is married to Kyle, and they have a son, Max. Mrs. Chambers enjoys camping with family and friends, reading with her book club, going for walks with Manx and dog, Diesel, and cheering wildly for the Missouri Tigers. This year marks the 24th year the Chillicothe School District has recognized excellence in the classroom by naming a Teacher of the Year. 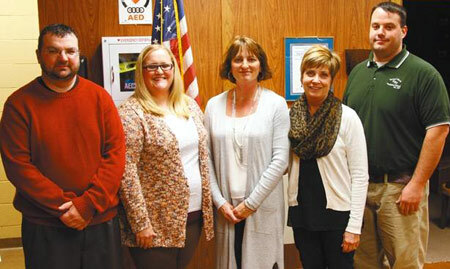 Through the support of the Chillicothe Education Foundation, a combined total of $10,000 was awarded to the six Chillicothe R-II educators who were been selected by their colleagues as individuals "dedicated to excellence in education, their profession, classroom, and most importantly, our District's students," Dr. Barnes said. Each individual that was recognized Friday received $500 cash and $1,000 for educational supplies, equipment, or professional development. Chambers received $1,500 cash and $1,000 for educational items. In 2007, the Beacon Award was established with the generous support from the Chillicothe Educational Foundation to recognize support staff who are the behind the scenes individuals that "make the district and profession look and be its best every day," Dr. Barnes said. The six Beacon Award candidates that were recognized Friday, because of their support and dedication for the district, teachers, and most importantly, students, received $100 and the officer Lewis (who was announced the winner) received $300. Officer Lewis has worked for the Chillicothe School District for a total of 15 years, all 15 years in his current position as School Resource Officer. Mike is married to kindergarten teacher, Rebecca. They have three children: Joshua, Jacob, and Meg. In his spare time he enjoys all sports and hunting. 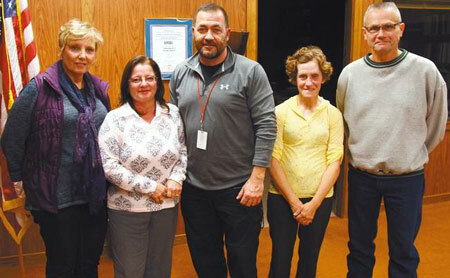 Teacher of the Year and Beacon Award candidates were recognized at the Chillicothe R-2 Board of Education meeting Tuesday night at the Administration Building. The 2015 Teacher of the Year candidates are: Patricia Adkison from Dewey / Garrison; Dianna Haynes from Field; Sophie Chambers from Central; Doug French from Chillicothe Middle School; Tim Cunningham from Chillicothe High School / Chillicothe Alternative Center for Education; and Brandon Dennis from Grand River Technical School. The 2015 Beacon Award candidates are: Rick McCully from Dewey / Garrison; Lesa Lee from Field; Polly Musselman from Central; Janet Abbey from Chillicothe Middle School; Mike Lewis from Chillicothe High School and Chillicothe Alternative Center for Education; and Ruth Summers from Grand River Technical School. Teacher of the Year candidates and Beacon Award candidates were nominated by fellow staff members. School administrators presented a list of criteria for each award to all staff members and asked them to select a worthy candidate based off of the criteria. Those who received the most nominations / votes were chosen as the building's candidates. When a staff member nominates another staff member, he or she must write why their nominated worker should be chosen. A couple of those support letters are sent to area superintendents who will review them and decide a winner. The Teacher of the Year candidate process is more intensive than the Beacon Award candidate process. In addition to being nominated, Teacher of the Year candidates are asked to submit an application (including their past experience, teaching philosophy, achievements, etc. ), letters of reference, and they also go through an interview process with area superintendents. Area superintendents meet at the Administration Building to review Beacon Award candidate letters of support and select a winner. Area superintendents will also review Teacher of the Year applications and conduct 30-minute interviews with teachers as well. Winners will be announced at the Performing Arts Center on Friday, December 4 at 2 p.m.